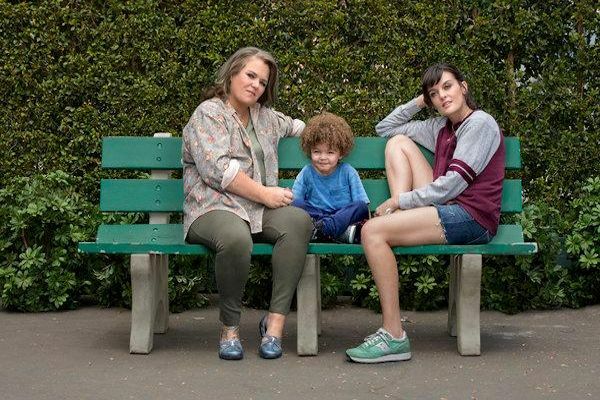 The hit Golden Globe(R) nominated SHOWTIME comedy series SMILF, starring creator, executive producer and showrunner Frankie Shaw in her Golden Globe-nominated performance and multiple Emmy(R) Award winner Rosie O'Donnell, will return to the network on Sunday, January 20, 2019 at 10:30 p.m. ET/PT. To preview what's to come for Bridgette Bird (Shaw) - a single mother living fearlessly - and her family, exes and friends, SHOWTIME has debuted a new season two trailer. Filmed on location in Boston, this season finds Bridgette trying to move forward and focus on her future, while attempting to exorcise old ghosts and atone for past misdeeds. She's still toiling away in her day job working for narcissistic boss Ally (guest star Connie Britton). Meanwhile, Bridgette's mother Tutu (O'Donnell) rallies from a heartbreaking setback punctuated by the presence of her co-dependent younger sister Jackie (guest star Sherie Rene Scott). Ex-boyfriend Rafi (Miguel Gomez) and his girlfriend Nelson Rose (Samara Weaving) grow closer, while Eliza (Raven Goodwin, now a series regular) deals with her own family drama. Viewers will also go back in time to witness the highly unconventional birth of Bridgette's beloved son, Larry (Alexandra and Anna Reimer). Season two guest stars include Oscar(R) and Emmy nominee and Golden Globe winner Melanie Griffith (Working Girl) as Nelson Rose's free-spirited mother Enid and Claudia O'Doherty (Love) as Nelson's disillusioned sister, Winnie; and Ally Sheedy (Psych) as Bridgette's midwife, Fiona. Additional guest stars include Stormy Daniels, Ari Graynor (I'm Dying Up Here) and Dan Aid. Mark Webber, Bodega Bamz, Blake Clark, Kimberley Crossman and Mia Kaplan return as guest stars. Shaw will also direct several episodes. Other directors this season include Emmy and Golden Globe nominee Kerry Washington (Scandal) and Cate Shortland (Marvel's Black Widow). Created, starring and executive produced by Frankie Shaw, SMILF is a raw, honest look at the life of a single mom based on Shaw's Sundance Film Festival(R) Jury Award-winning short film of the same name. The series, which earned Shaw a Best Actress Golden Globe nomination, also stars O'Donnell in her first series regular TV role. The series takes a comedic look at the life of a young woman from South Boston who struggles to overcome her personal demons, as well as the circumstantial trials and tribulations of working class single motherhood. Shaw brings her singular, unapologetic point of view to the semi-autobiographical comedy series, whose title is meant to be ironic and to reclaim the demeaning nature of the label. The cast also includes Miguel Gomez, Samara Weaving, Raven Goodwin and Alexandra and Anna Reimer. The wildly successful sitcom Bunk'd has been ordered for a fourth season by Disney Channel. Production will begin in March 2019 on the series starring fan-favorite Miranda May as Lou Hockhauser, the cheerful Woodchuck counselor turned owner of Maine's rustic Camp Kikiwaka summer camp. The series also stars Mallory James Mahoney (Disney Channel's Adventures in Babysitting), Raphael Alejandro (ABC's Once Upon a Time) and Will Buie Jr. (Gifted) as the campers who return with Lou to create a summer of fun and friendship for a new group of young campers. Additional casting is to be announced. Created by Pamela Eells O'Connell, Bunk'd began as a spin-off to Disney Channel's hit series Jessie (2011-15). Actors Peyton List, Skai Jackson and Karan Brar starred in both series and after 98 episodes of Jessie and 58 episodes of Bunk'd, they concluded their run on the series. List and Brar also made their directorial debuts with episodes of Bunk'd.